A young girl shelters from the rain in Baharka IDP Camp, in northern Iraq (October 2014). The United Nations refugee agency has reported that Iraq will continue to need greater humanitarian assistance as the country’s displacement crisis shows no sign of easing, with more than 3.4 million people displaced and ongoing conflict causing thousands more families to leave their homes in search of safety. The Director of the Middle East and North Africa Bureau (MENA) for the Office of the UN High Commissioner for Refugees (UNHCR), Amin Awad, visited Debaga camp in Makhmour district in KR-I, where more than six thousand newly displaced people have sought shelter and are living in overcrowded conditions. UNHCR is going to provide additional shelter for 550 families at a new tented camp set up by the agency at the football stadium. Meanwhile, families in Debaga have fled their villages as the Iraqi Security Forces continue their operations to re-take control of villages held by extremist groups. "As the Iraqi security forces continue their advance towards the Tigris river, civilians continue to flee their homes to avoid being caught up in military clashes. We anticipate that there could be up to 30,000 newly-displaced arriving in Makhmour in the next few weeks,” warned Mr. Awad upon concluding a visit to Erbil and Basra . During talks in Erbil with the Prime Minister of the Kurdistan Regional Government, Nechirvan Barzani, and other senior ministers, Mr. Awad acknowledged the generosity of the KR-I authorities in providing humanitarian assistance to both Syrian refugees and displaced Iraqis despite facing serious economic challenges. 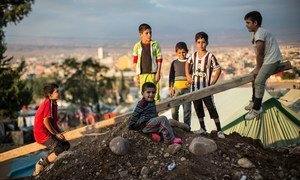 Around 98 per cent of Syrian refugees in Iraq are living in the Kurdistan Region, in addition to more than one million Iraqis displaced due to conflict – a figure accounting for 25 per cent of the population of KR-I. In Basra, UNHCR’s MENA director visited a collective centre hosting 90 displaced families in a market structure rehabilitated and partitioned to ensure privacy and dignity to families. He also met families receiving emergency relief items from UNHCR staff. Meeting with senior officials from the Governorate, Mr. Awad paid tribute to efforts by the authorities to provide assistance to asylum seekers, especially Syrian refugees in Iraq, while at the same time having to deal with large-scale internal displacement. Basra has received more than 3,500 families - an estimated 21,000 individuals - who have been displaced from Anbar and Ninevah provinces since 2014. "What I have witnessed in Basra is very encouraging: generosity and solidarity from Iraqi to Iraqi across sectarian and tribal lines," said Mr. Awad. "This solidarity gives us some hope for the future," he concluded. Despite the likelihood of increased demands for humanitarian assistance, overall funding for the 2016 plan to help nearly 250,000 Syrian refugees in Iraq (the Syria Regional Refugee and Resilience Plan, or 3RP) is just 23 per cent funded, while the UN’s Humanitarian Response Plan for Iraq this year is only 22 per cent funded. A total of 741 Iraqis were killed and another 1,374 were injured in acts of terrorism, violence and armed conflict in Iraq last month, according to casualty figures recorded by the United Nations Assistance Mission for Iraq (UNAMI).